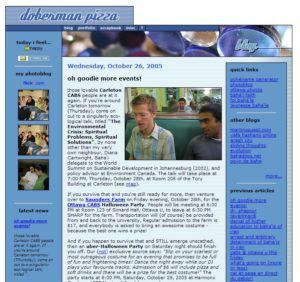 the old blogging days | doberman pizza. So, since we were talking about websitesthe other day, I thought I’d go back to that subject a little and ramble on about the Internet. Because, you know, nothing is more meta than getting on the Internet to read what people have to say about the Internet. So come, let us sit on the porch in our rocking chairs, and shoot the breeze about the good old days of Doberman Pizza and Bahá’í blogging. One of my favourite taglines for doberman pizza is “rolled, dressed and cooking since 1994“. That was the year when I first uploaded my homepage to a local Internet Service Provider, complete with wild rainbow colours, insane graphics and even insaner content. One of my first web projects, Find The Beagles, is still online after all these years, and still sports the same look it did way back then. 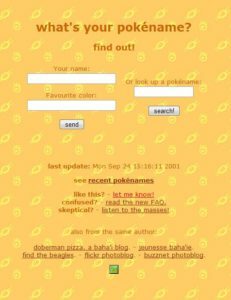 What’s Your Pokéname?, a frivolous name generator that I coded up while in university, has only changed a little since the early days, but miraculously, it still gets over a thousand hits per month. whoops, left at 01:57 on 19/12/00: I just erased netscape by mistake! How *^$@# cool am I? you’re e, left at 14:49 on 26/01/01: this is me at shamdogg’s place doing SECRET SQUIRREL things. peace to you all. thwomp, left at 09:38 on 19/03/01: do you realize that this website is almost completely purposeless? that’s a rather interesting concept! the main event, left at 07:23 on 22/05/01: In case you haven’t heard, the terraces of the Bahá’í World Centre in Haifa, Israel are being officially opened today. They’re broadcasting it live on the web, in realplayer format. it’s going on today and tomorrow. Check it out! Around 2007, things had started to get pretty well organized in the Bahá’í blogosphere, as we called it. I had my own 15 seconds of fame when my blog and I were featured in an article for the Canadian Bahá’í News Service. But soon enough, newfangled Web 2.0 websites started appearing, like Facebook, Twitter, and the like, and blogs started losing a lot of the prominence they once had. For me, I also got pretty busy around this time, and I hopped over to Vietnam, where my life got turned upside-down. As a result, Doberman Pizza took some extended down time, and for a while I wasn’t even sure if it would ever get going again. That’s why things like this Bahá’í Blogging Challenge are really a stroke of genius. First of all, you have the challenge—go ahead, post something new every day, I dare you. A call like that has to be answered, and the requirement to post each day gets the creative juices flowing out of necessity. Second, you have the added benefit of support from all of the other poor souls who are also toiling through the challenge. In fact, some of the old-school bloggers I mentioned above, such as Sholeh at A Calm Storm and James at Warble are participating, too—check out what they’ve been writing, and get wowed by how far back their archived posts go. All in all, it encourages us to rise above the lethargy imposed upon us by our busy lives and just create—spin our words into something beautiful, just like we did in the old days. Hmm, speaking of the old days, maybe I should go hang out at Shamdogg’s place. ben to tings. you’re e.
This entry was posted in baha'i blog and tagged bahaiblogging, blogs, doberman pizza, internet by danger. Bookmark the permalink. i could use some chocolate, left at 16:25 on 22/01/01: I wonder if anyone actually reads this. A guy from a record company in the UK emailed me today to tell me that he had a discoball and puked fire. I was more impressed with him having a bandolierful of 8-track tapes and a discoball, tho. Très retro. Whereas I have a MAGIC CHEST OF HATS. Aww! I’m so glad that some of us kept it up. I think that social media definitely killed a lot of the blogs, but some of my best friends come from the Baha’i blogosphere, so I’m always going to be grateful for it. Same here! And even though social media replaced a lot of blogs, it did force the blogs that remained to get bigger and better, in a way. Bahá’í Blog probably wouldn’t be what it is today if that transformation hadn’t taken place, and we probably wouldn’t have awesome, collaborative blogs like Bahá’í Teachings either. Agreed! I think Nineteen Months started taking over my life around when I started posting less to my blog.